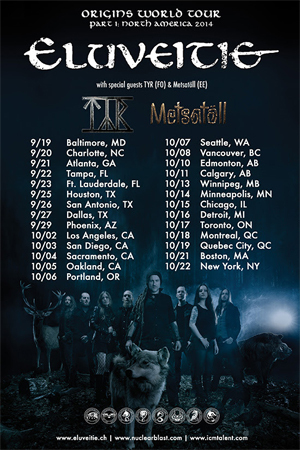 TÝR will be returning to North America in the fall of 2014 with Switzerland's ELUVEITIE! Estonia's METSATOLL will be the opening act for the tour. Tickets will be on sale soon, and details will be posted to the bands' sites when they are available. The tour will begin on September 19th in Baltimore, MD. The confirmed list of dates are available below. Earlier this year, TÝR unveiled the music video for "The Lay Of Our Love", from their most recent album, Valkyrja. The song features a vocal duet with LEAVES' EYES vocalist Liv Kristine. So, naturally, fans will be excited to see that Kristine joins Heri Joensen and the rest of TÝR in the video! "The Lay Of Our Love" was produced by Stanimir Lukic, directed by Ivan Colic, and can be seen now right HERE.